(Newser) – Missouri has its first openly gay Miss Missouri, and she will represent the state at the Miss America pageant later this year, the AP reports. 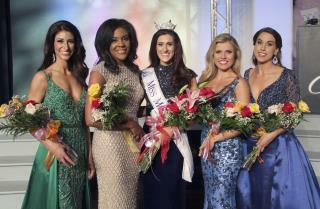 Erin O'Flaherty, 23, was crowned Miss Missouri on Saturday in Mexico, Missouri, and is the first openly gay woman to be named Miss Missouri, said Ann Jolly, chairman of the board of the Miss Missouri Scholarship Organization. O'Flaherty said Wednesday in a telephone interview with the AP that she came out as gay when she was 18, competed openly, and knew going into the Miss Missouri pageant that she'd be making history if she won. "I'm on cloud nine really just to be Miss Missouri," she said. "I don't know that I intended to be the first, but I am. So I'm very excited about it." as long as she is a she it is ok with me! love to see a trans try this! Just don't call it homophobia if she loses. "Don't judge!" Oh wait. This is a beauty pageant, right?